This Jelly Roll is old, years old … maybe 10? It was time for it to come out and play. This one was made on the Handiquilter! Sherry Rogers-Harrison has a pattern/tutorial. I did the pattern test. 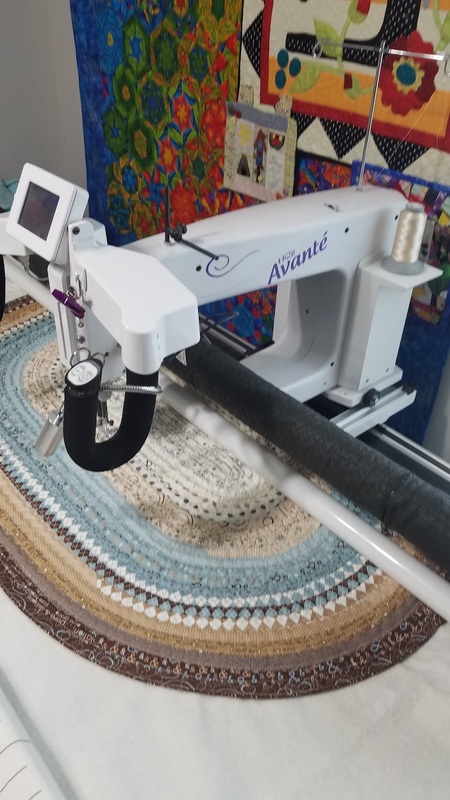 Jelly Roll Rug on a longarm! 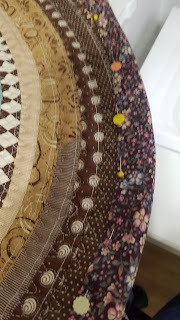 I did not do Sherry's binding method - which is lovely. I did a (sort of) traditional binding. Cut BIAS strips at 2.5" and joined them together. 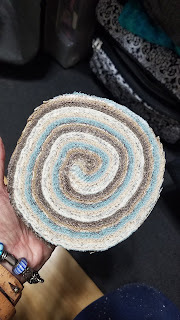 I ended up with about 180" of binding for my rug made from 42 WOF strips. 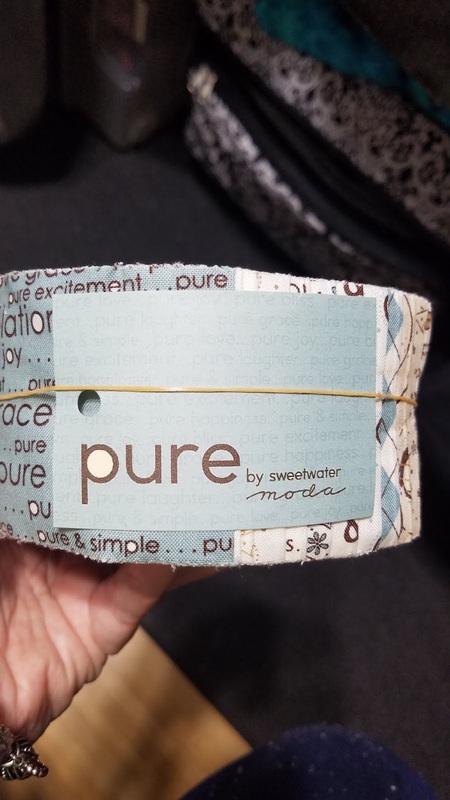 I did NOT fold the binding in half. I did pressed under about 1/2" on one long side and then stitched with 1/4" seam the other long side to the BACK. Rolled the binding to the front and zigzagged stitched. I used Quilters Dream Batting (80/20). I used a piece of upholstery fabric for the backing. 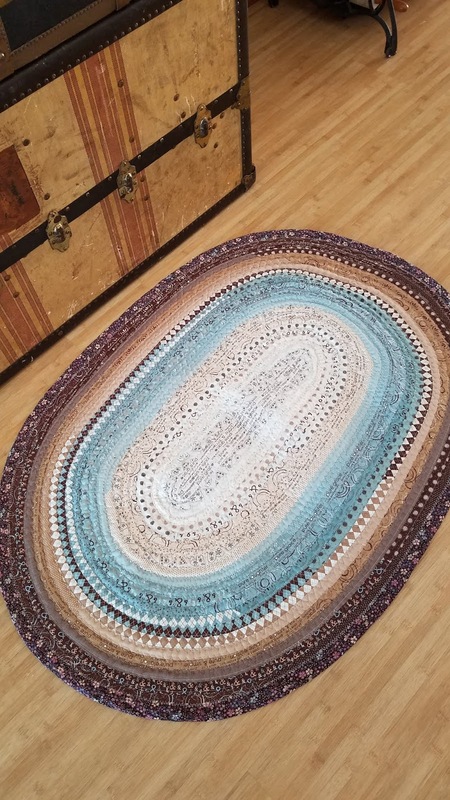 I loaded it "good side" up so the back of the fabric is actually the back of the rug. The back of the backing (still with me?) is a little tacky (in a "sticky" way) and I had hoped it would make the rug less slippery on the floor. It worked - some what. I'm still thinking about making a Christmas rug. I might be over this craze … for now.